In December 2012, Microsoft released their next interim release to significantly increase the functionality of Dynamics CRM. Microsoft introduced a brand new look and feel in their user experience (UX) which they call the “Flow UX.” They’ve given this overall release the code name “Polaris” (after the star of the same name). 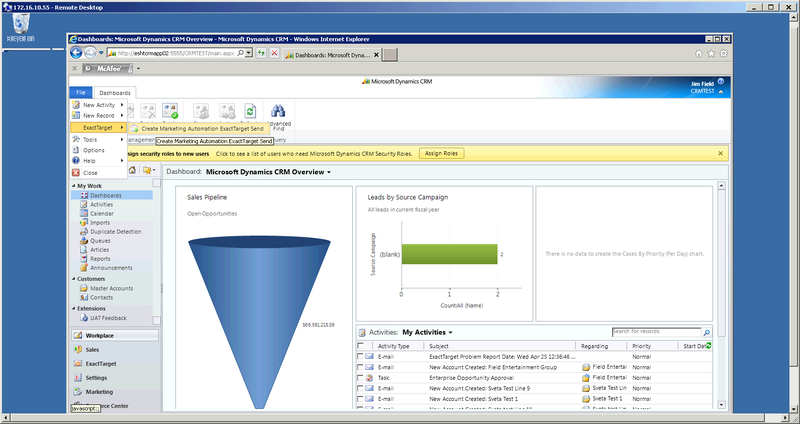 Presently, Microsoft has made the availability of Polaris to CRM 2011 Online customers only. If you have an on-premise implementation of CRM, the Flow UX won’t be available until the release of CRM, code named “Orion” coming out sometime in Q3 2013. Until then, on premise users can at least experience the browser updates via Update Rollup 12. Overall, the Polaris release is a good next step forward and will help in combatting some of the weaknesses of the classic UX as compared to some of Microsoft’s competitors. For organizations already accustomed to using Dynamics CRM, some of the drawbacks in the new Process UX may present some challenges. Organizations new to Dynamics CRM may not notice all or any of the drawbacks, depending on their needs. Generally speaking, it feels like there are several additional components that Microsoft would have included but decided to postpone to a later date. What exactly these were, I hope will be additional activity options and putting back in the loss of some of the ribbon options. We will have to wait for Orion to find out for sure. In the meantime, Polaris provides many new opportunities to provide customer relationship management than we had before. It’s tax season….the IRS does not have to be the only ones auditing! Enabling auditing is a quick and effective way to help ensure data integrity. Have you ever had a Sales Rep ask who changed the status of a record? Have you ever wondered who deactivated a large set of account records? These types of questions and hurdles can easily be answered through auditing. 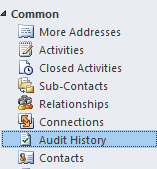 Click the Start Auditing box then select the areas where you wish to enable auditing. 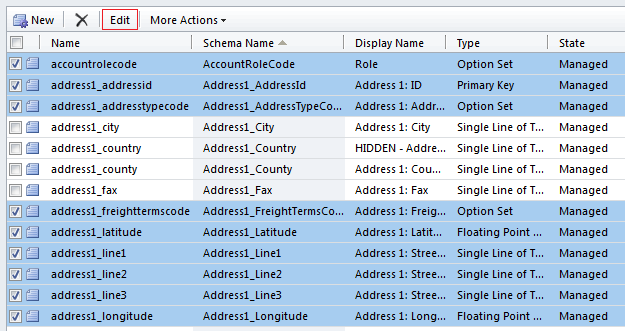 You can hover over the area names such as “Common Entities” to see a list of the entities included. You also have the choice to customize which entities you would like to audit. 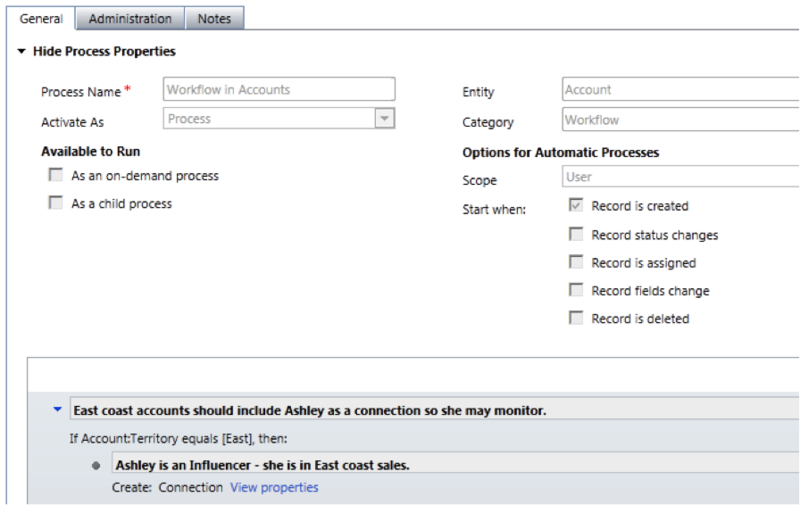 Open the solution, click on the name of the entity and select “Auditing”. Be sure to read the fine print! When you select Auditing, all fields within the entity are being audited by default. There are two options to disable fields. 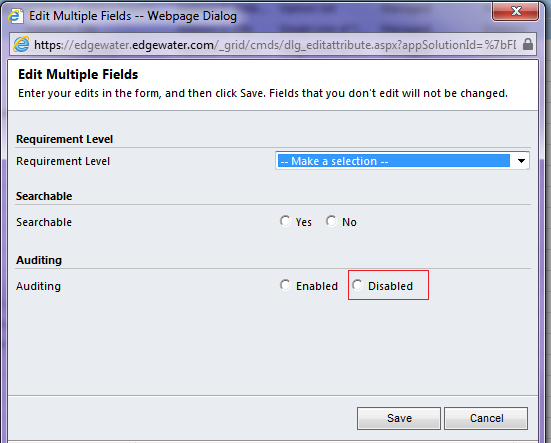 Option 1: You can open each field that you do not want audited and click disable auditing. Option 2: You can select multiple fields on the entity and select ‘Edit’ and you can change the status of auditing per field there as well. Navigate to the record, on the left side toolbar click Audit History. This view list the date a change was made to the record, who made the change, the event which occurred, the name of the field changed, the old value and the new value. In the example below, the Business Phone was changed from 904-555-1212 to 904-222-8888 and an extension was added which was previously blank. The change was made by Ashley Kleeman on 4/15/2013 at 12:06 pm. Review security roles to ensure users have the appropriate access to view audit history. Open the security role, click on the Core Records tab and you will see the Audit related buttons at the bottom of the page under the Miscellaneous Privileges section. The average user only needs access to “View Audit History”. Creating and maintaining profitable customers is the main aim of business. Therefore, customer satisfaction leading to profit is the central goal of hospitality marketing. In the hospitality industry, the marketing department tends to be responsible for both Business-to-Consumer (B2C) and Business-to-Business (B2B) marketing. The marketing team needs detailed data on prior leisure and business guests to successfully target marketing campaigns to the appropriate audiences. The main purpose of this article is to discuss B2C marketing and in particular a process called Trigger based Marketing in Microsoft Dynamics 2011. 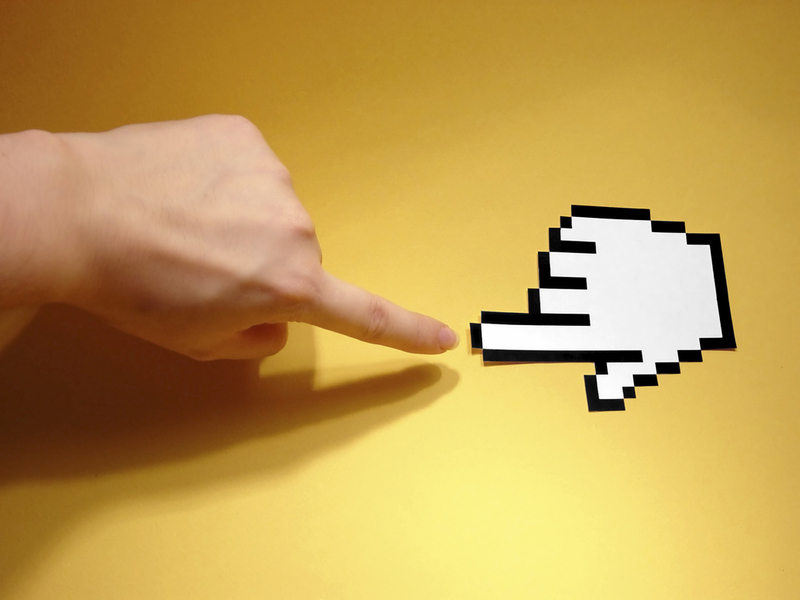 What is trigger based marketing? For the purposes of this article, trigger based marketing is defined as consumer profile or stay data meeting the criteria of a marketing list for an active campaign. This active campaign then processes an e-mail blast to the recipients of the marketing list on a scheduled and automated basis. So, the next question becomes, “Once the triggered campaign requirement is satisfied how does the e-mail blast execute on a scheduled basis?” To satisfy this requirement a third party marketing integration product such as ExactTarget, CoreMotives, or ClickDimensions can be used. 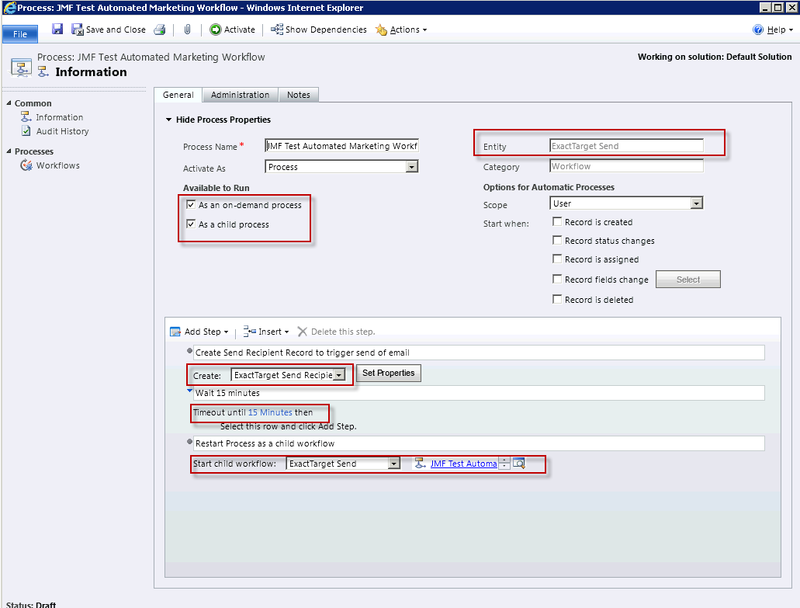 These are just some third party marketing integration products for CRM 2011, there are additional products out there. Most of these third party marketing add-ons tend to have Application Programming Interfaces (APIs) available that can be programmed. In this particular instance, ExactTarget and the ExactTarget API were used to achieve the requirement of executing the e-mail blast on a determined schedule. The processes developed contain a combination of manual and automated processes to complete the triggered e-mail process. STEP 10: Custom application runs at a schedule time on a nightly basis and performs a lookup against active campaign configuration records. Deactivated campaign configuration records will not be executed against. While this application will run on a nightly basis by default, it will use the configuration record for each active triggered campaign to determine the appropriate schedule (daily, weekly, monthly) it needs to run at for the automated campaigns. For daily processing, the custom application will run every night at a given time. For weekly processing, the custom application will check the day of each week of the current day and compare it to the list of days of the week selected in the configuration record. If the current day of the week matches any of the selected days of the week in the configuration record, it will run. For monthly processing, the custom application will run on the date selected on the configuration record. Therefore, the custom application will run on the exact same day each month. The custom application is setup and scheduled using the windows task scheduler. 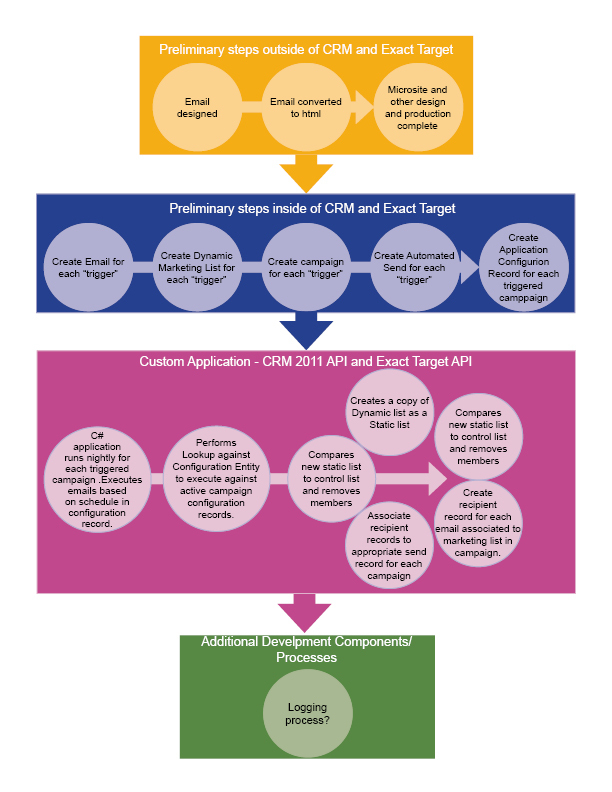 In conclusion, while this is only one solution of meeting a requirement to process triggered campaigns using Dynamics CRM 2011 and ExactTarget, other solutions can be created using Dynamics CRM 2011 and other third party marketing integration products. Why pay for CRM when I have Excel? What CRM provides is not just a way to spend money, but a way to save time and help support your business in ways that many don’t consider. There are many ways that any CRM would make a value-added investment. Two of the foremost ways are: 1) A CRM connects and relates different records together as a part of the normal way the data is entered. You don’t have to remember to do this… it prompts you to do it! 2) It helps you remember to do activities you might have forgotten to do or document. Let’s dissect Microsoft’s Dynamics CRM® in some more detail and understand some of the most important ways it offers you a return on your investment! The human mind can more quickly interpret and make decisions when seeing a picture than when reading. This is why CRM has built in Dashboards to help get a visual understanding of your data. You can analyze and drill down on your data graphically or quickly get to the underlying data too. Available in the cloud or on your desktop! CRM is available when and where you need it. You can work how and when you want. As of the December 2012 release, it is now even available on web browsers other than Internet Explorer so you may use it in the cloud the way you want to! CRM allows you to have multiple custom screens so that only the most appropriate layout and fields may be seen by a user… you can have multiple views of records too! Ever launched a marketing campaign and you don’t know if it was worth the money? 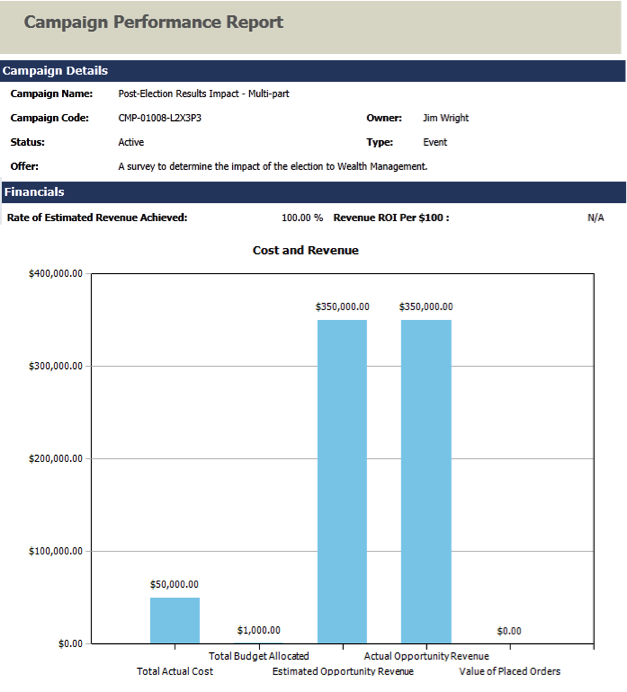 CRM allows you to connect related responses to your campaign along with the prospects and opportunities it generates. As you can see, CRM can bring value and Microsoft Dynamics CRM has some of the greatest value-providing ways to help you do more business with less time and waste. Do you miss your excel though? Not to worry; you can still have your Excel! Now you decide… Would you consider paying for CRM over just using Excel? Although Microsoft recommends using early binding over late binding in Microsoft Dynamics CRM® 2011, my experience is that querying data is faster when using a late binding approach. A mix of early and late binding. The above results show that the late binding, approach #2, when retrieving multiple records, is the fastest approach. The above results also highlight that, when retrieving, a specific account by its unique identifier, the late binding approach also out-performs the early binding. In addition to the above tests, I also compared the performance of returning all columns versus only a few. Changing the number of columns did not affect performance that greatly. For late binding, specifically, in the case of Approach #2, RetrieveMultiple, changing the number of columns greatly affects performance. Controlling columns returned is accomplished by the QueryExpression Columnset property. In my tests, when setting Columnset to true, I actually encountered a timeout exception. (Note: the timeout depends on the number of records that are returned. In my case, returning over 300 thousand put too large a demand on the query.) The following error can be seen in the event viewer, located on the CRM server. To learn more about Edgewater’s CRM offerings, click here. It is imperative to ensure the optimal performance of any custom applications, plug-ins, or add-ins developed using the Microsoft Dynamics CRM 2011 SDK. When using paging to restrict the number of rows returned by a custom application. NOTE: For Microsoft Dynamics CRM deployments that are integrated with other systems, test custom applications in an environment similar to the complexity and integration present in the production environment. Another thing to keep in mind is that performance results may vary if the database on the test system is not of similar size and structure to that in the production environment. Organizations that have smaller data sets and a smaller amount of users can deploy on a single server or on two servers, with one computer running Microsoft Dynamics CRM Server 2011 and the other computer running Microsoft SQL Server and SQL Server Reporting Services. Performance will be affected with larger datasets, more users, or heavier loads. Optimizing reporting services would be required, if it is noted that the usage for reports has increased. Ensure that the computer hosting the report server includes ample memory as report processing and rendering are memory intensive operations. Host the report server and the report server database on separate computers instead of hosting both on a single high-end computer. When there are signs of all reports processing slowly, contemplate a scaled-out deployment with multiple report server instances. For best results consider using load balancing software and hardware to allocate requests evenly across multiple report servers in the deployment. If only one report is processing slowly, tune the query if the report must run on demand. Consider caching the report or running it as a snapshot as well. One of the key benefits of using a third party direct email marketing tool with Dynamics CRM is the ability to automate the sending of emails when some event happens or a period of time elapses. 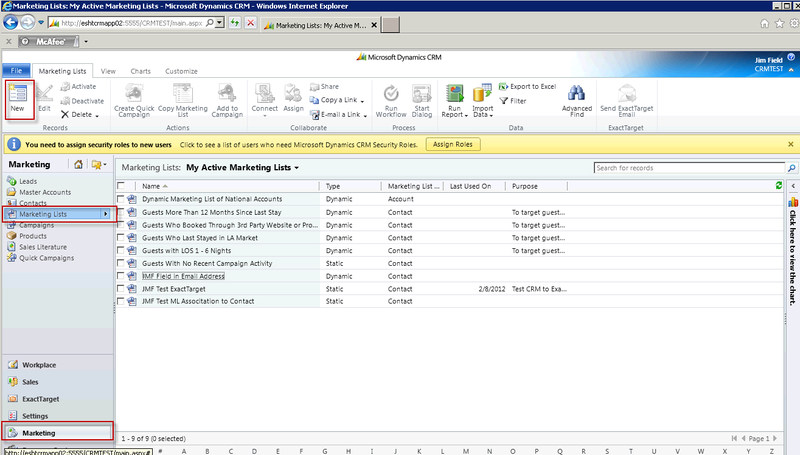 This blog discusses how to create an automated email sent from Dynamics CRM using ExactTarget. The email will be scheduled to be sent to a dynamic marketing list every 15 minutes. In practice you would use this method to send an email every 30 days or some similar time frame, or when some event, such as the creation of a particular record, occurs. The first thing you need to do is create a dynamic marketing list in CRM. To do this, go to Marketing, Marketing Lists and click New. On the Marketing List screen, enter a Name, set the Contact Type and set the Type field to Dynamic. Save the marketing list record and click Manage Members. The query screen will appear in which you can specify your criteria which will be executed each time the email is sent out. 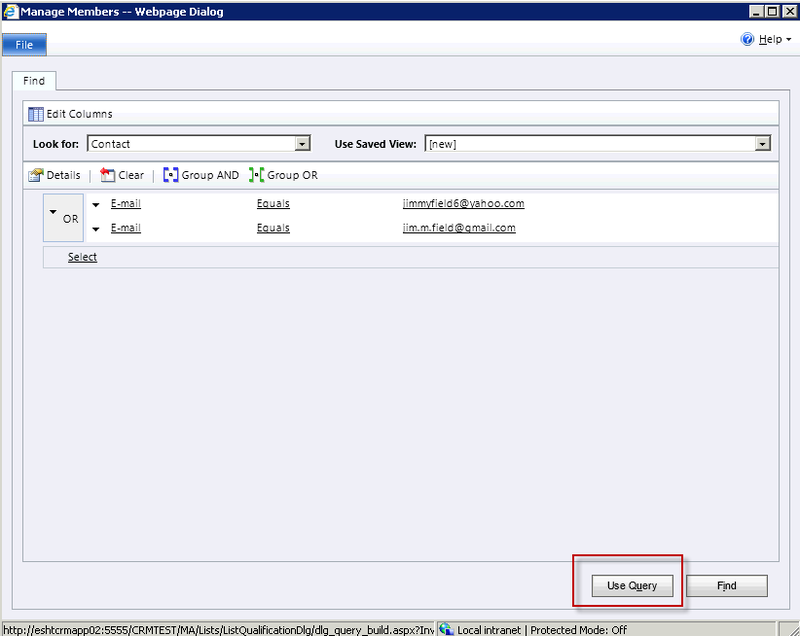 Click the Use Query button when the query is ready. Once you have your marketing list ready, go to File, ExactTarget, Create Marketing Automation ExactTarget Send. 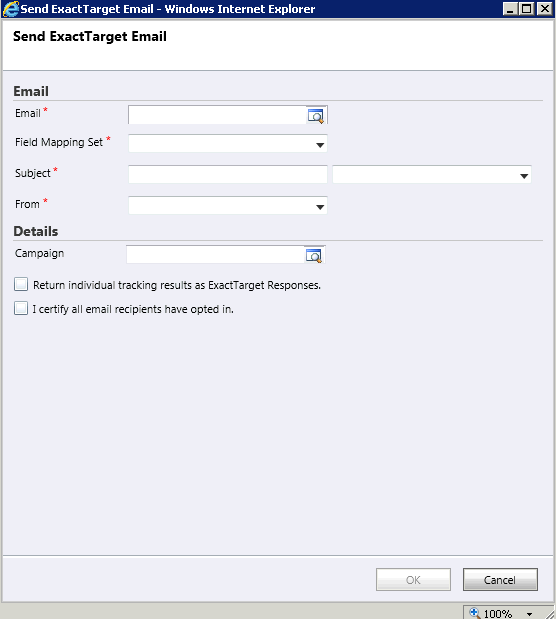 On the Send ExactTarget Email screen, select a pre-defined Email template, Field Mapping Set, create a Subject, set the From value, select a Campaign if desired, check the “Return individual tracking results as ExactTarget Responses” and “I certify all email recipients have opted in” checkboxes and click OK.
Now that you have an ExactTarget Send record, emails will be sent through ExactTarget to the marketing list every time an ExactTarget Recipient record is created. To automate the sending of emails, you will us a CRM workflow to create the ExactTarget Recipient record when you want the email to go out. To do this, go to Settings, Processes and click New. 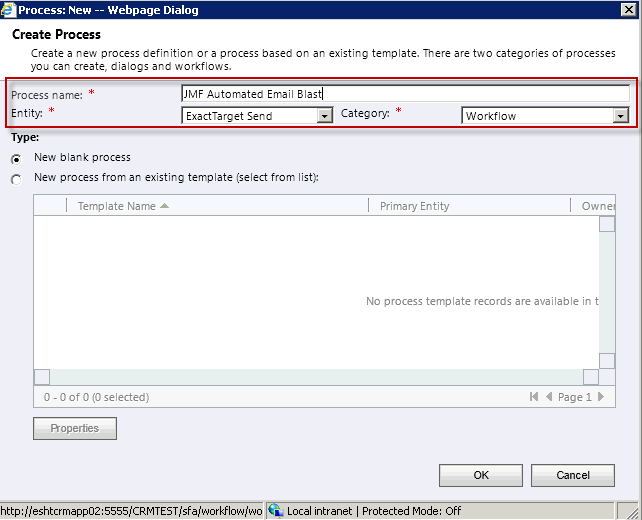 On the process screen, enter a Name, set the Entity Type to ExactTarget Send and the Category to workflow. 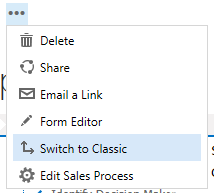 Leave the “New blank process” radio button selected. Click OK to go to the Process definition screen. On the Process definition screen, check the “As an on demand process” and “As a child process” checkboxes, clear the New Record checkbox and save the record. Now you need to create the steps of the workflow. Click Add Step and select the Create action. Select ExactTarget Recipient as the entity type to create. 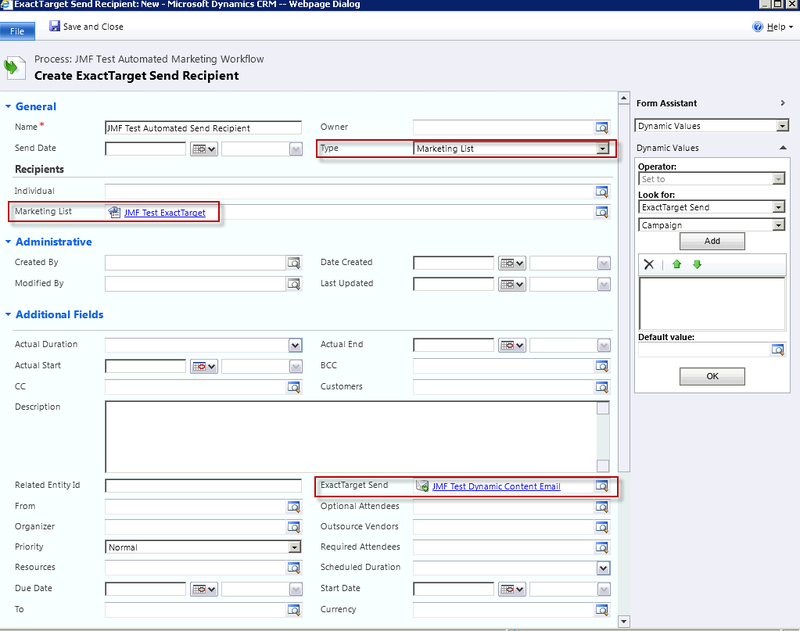 Click Set Properties to set the values of the ExactTarget Recipient record. Set the Name, Type, Individual or Marketing List field depending on the value of the Type field, and select the ExactTarget Send record. After setting the properties of the ExactTarget Recipient record, set the time period to wait until the next send. 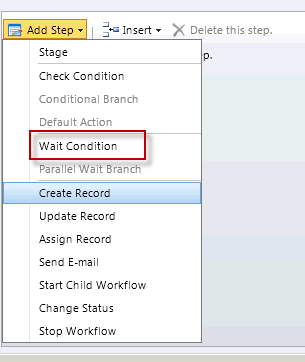 To do this, click Add Step and select Wait Condition. Click on “<condition> (click to configure)” to open the Wait Condition screen. When the Wait Condition screen appears, select Process, Timeout, Equals, 15 minutes duration and Save and Close. To run the workflow again after the specified time period has elapsed, add a step to call itself as a child workflow. 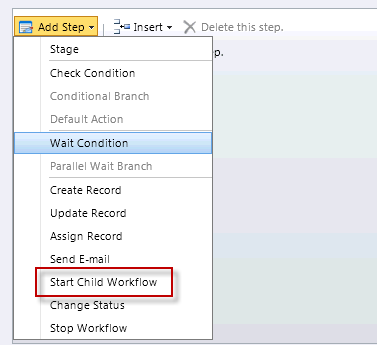 To do this, click Add Step and select Start Child Workflow. Now activate the workflow and every fifteen minutes it will execute the marketing list query and create an ExactTarget Recipient record to send the email to the current members of the dynamic marketing list. When enabling new workflow options in Microsoft Dynamics CRM 2011, the overall performance of the implementation can be affected. Keep in mind the following best practices, when considering how to ensure that Microsoft Dynamics CRM workflow functionality performs optimally for a particular implementation. Determine the business purposes for implementing workflow prior to enabling the functionality. During planning, analyze the business scenario and define the goals of workflow within the solution. Workflow functionality can provide for businesses’ process automation, exception handling, and end-user alerts. 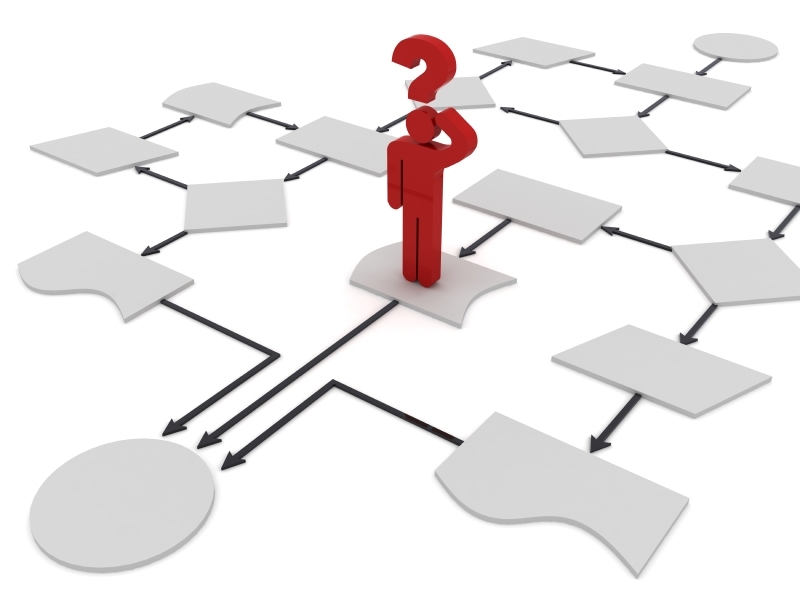 Decide on the appropriate security/permissions model for workflow. With established business goals in place, determine the scope of users that will be affected by the workflow implementation. Users should be identified to determine who will create and maintain workflows, apply and track workflows, and troubleshoot workflow issues. Use the Scope property sensibly. The Scope property associated with workflow rules defines the extent of records affected by that rule. For example, rules configured with a User scope affect only the records owned by that user, while rules configured with an Organization scope will affect all records within organization, regardless of which user owns each record. When creating workflows make sure to identify the appropriate scope value for each workflow rule to minimize the number of related system events. Considering the factors above in the system on a typical day provides for better comprehension of the processes and load variance. Based on this analysis, the workflows can be optimized as required. Workflows that include infinite loopbacks, due to semantic or logic errors never terminate through normal means, therefore greatly affect overall workflow performance. When implementing workflow functionality within a CRM 2011 deployment, be sure to review the logic in workflow rules and any associated plug-ins for potential loopback issues. As part of ongoing maintenance efforts, periodically publish workflow rules and review them to ensure that duplicated workflow rules are not affecting the same records. When defining workflows that are triggered on update events, be cautious. Taking into account the frequency at which ‘Update’ events occur, be very particular in specifying which attributes the system looks for to trigger updates. Also, avoid using ’Wait’ states in workflows that are triggered on Update events. Scale out as necessary, to improve performance in large deployments. Use dedicated computers to run the Async service for large-scale deployments. That being said, increasing the number of servers running the Async service creates additional stress on the server running Microsoft SQL Server. Therefore, make sure to follow appropriate optimization and tuning strategies on the data tier and investigate the possibility of increasing the number of computers running Microsoft SQL server. Test workflows. Make sure to test and monitor the performance of new workflow functionality before implementing it in a production environment. Async plug-ins. Think through whether plug-ins should run synchronously or asynchronously. When the priority is user responsiveness, running a plug-in asynchronously will enable the user interface to respond quicker to the user. But, asynchronous plug-ins introduce added load to the server to persist the asynchronous operation to the database and process by the Async Service. When scalability is essential, running plug-ins synchronously typically requires fewer loads on the servers than running plug-ins asynchronously. 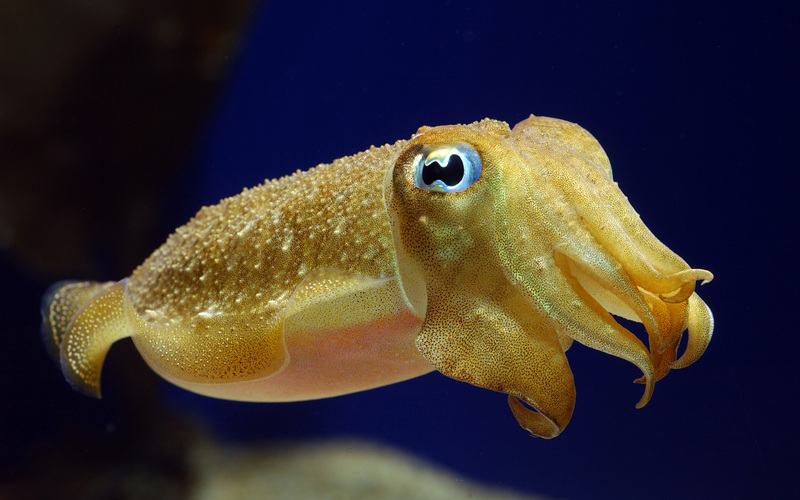 Balancing workflows and asynchronous plug-ins. Asynchronous plug-in and workflow records in the asyncoperationbase table are managed with the same priority. Hence, introducing a large number of asynchronous plug-ins into a system can reduce overall throughput or increase the time between triggering and processing of individual workflows. For that reason, make sure to consider the relative importance of the workflows in the system before adding numerous asynchronous plug-ins to the solution. Child Workflows. Child workflows run as independent workflow instances from their parents. This can facilitate parallel processing on a system with spare capacity, which can be useful for workflows with multiple independent threads of high processing activity. Additional overhead can be introduced if the parallel processing is not critical because other workflow logic threads are blocked waiting for external events to occur. NOTE: If workflow functionality within a CRM 2011 implementation is not acting as expected, verify that the Async service is running properly. Often, restarting the Async service will unblock workflow processing without affecting the functionality of the workflows that were in the pipeline. 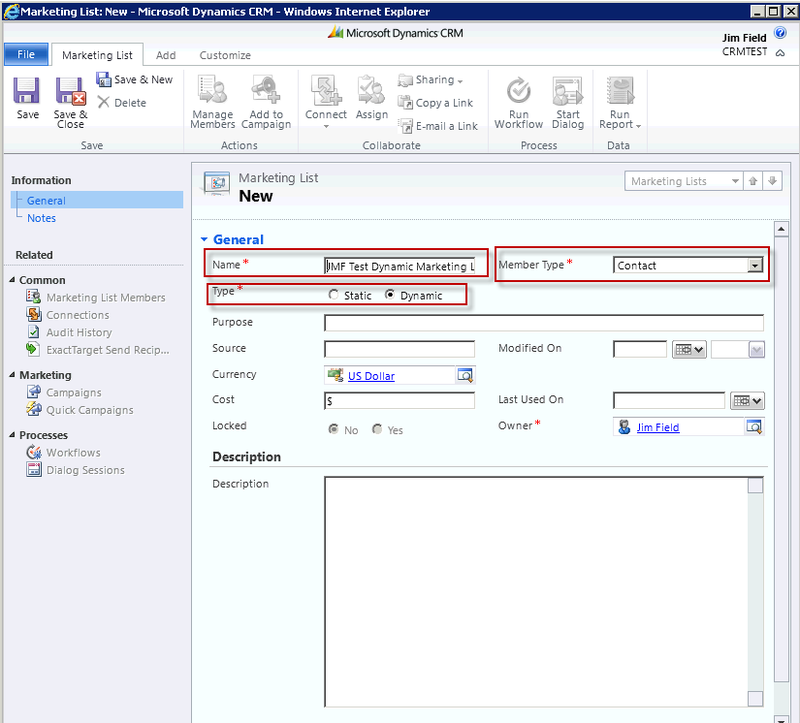 Monitor the Microsoft Dynamics CRM 2011 database for excess workflow log records. Workflow processing in Microsoft Dynamics CRM depends on on the Asynchronous Service, which logs its activity in both the AsyncOperationBase table and WorkflowLogBase tables. Performance may be affected as the number of workflow records in the CRM 2011 database grows over time. 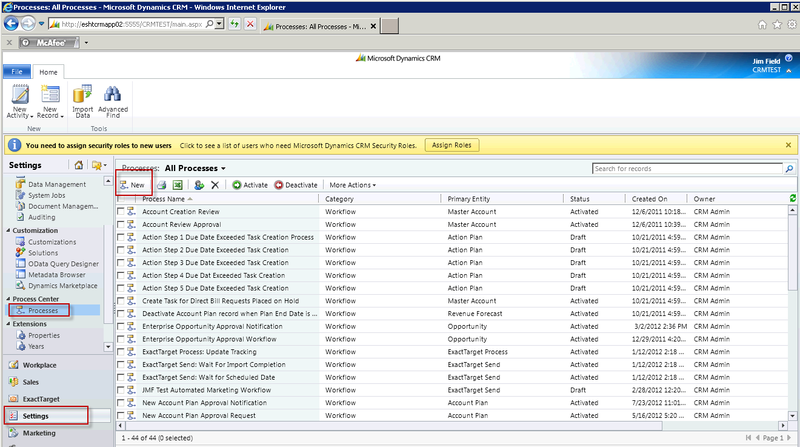 The ‘AsyncRemoveCompletedWorkflows’ setting is visible to users in the interface for defining new workflows, and users can set the Removal flag independently on each of the workflows they define.NOTE: When registering an Async plug-in, users can also specify that successfully completed Async Plugin execution records be deleted from the system. Using the deployment Web service, users can change the AsyncRemoveCompletedJobs setting by. Nonetheless, the setting is by default configured to True, which ensures automatic removal of entries for successfully completed jobs from the AsyncOperationBase table.